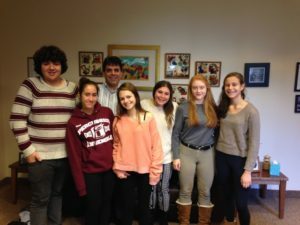 In the Confirmation program (10th Grade), students are challenged to think about their individual beliefs, and how they can create for themselves a meaningful Jewish life. They build a class community based on trust and clear thinking. The Confirmands are encouraged to challenge each other by asking important questions about Judaism and Jewish values. The year includes a class trip to Washington D.C. with a focus on social action and will culminate in a Confirmation Service at the end of the school year. Students exemplify the lessons they have learned through their speeches and their actions. Your family will be invited to a meeting with the Rabbi and Educational leader to begin planning for this wonderful Simcha! You will receive a Confirmation Family Handbook at this meeting to explain all the details.